Note: As of mid-June 2018, only a test environment is available from EPA. Fill out the information for your Organization (not necessarily your site), Job title, phone, and email address. VA988177803, "HEATING AND OIL", Virginia 22033 (Generator Only). VATEST000001, "TEST TRANSPORTER 1 OF VA", Virginia 22202 (Generator or Transporter). VATEST000002, "TEST TRANSPORTER 2 OF VA", Virginia 22202 (Generator or Transporter). Request a role for the site. The Site Manager Role will allow you to use the services. After you submit your request, the request will go to your state or an EPA administrator. It is important to understand this is not an instant access process and the administrator will need to manually process your request during normal business hours. EPA is continuing to work on the concept of a Site Manager which will allow users to manage their own users. Once you have completed this registration you may use either https://test.epacdx.net/ or https://rcrainfopreprod.epa.gov/rcrainfo/ to log on to the application. If you want to register for an API ID and Key to test the services, you may create one by clicking on the Tools - > API. The API page will allow you to generate your unique API ID and Key. Once you have your API ID and Key, you can enter them in the EMS system setting parameters in order to be able to submit Manifest electronically through EMS. Open the system settings table from the left-side menu (Settings < Administration < System Settings). Open the Waste tab from the left side menu. Go to “eManifest” section. 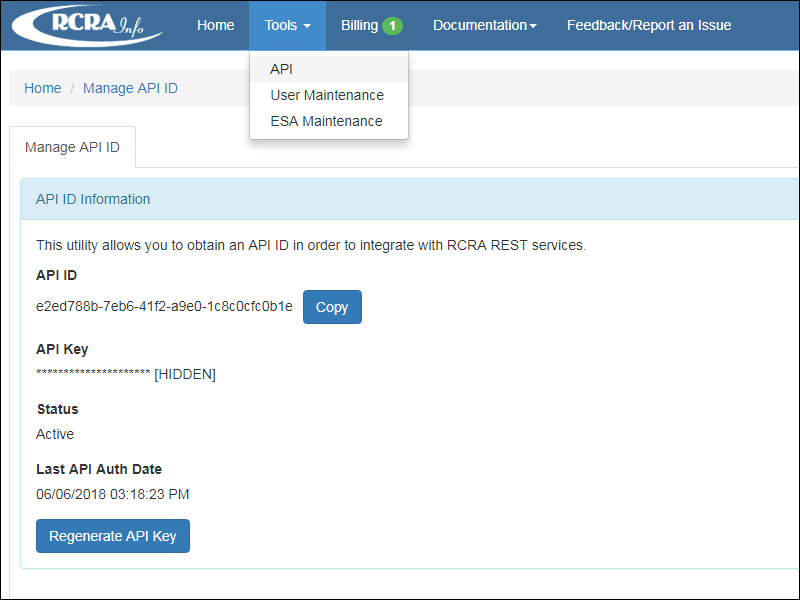 There you may enter the API ID and API Key generated from EPA site and click on the save button. 6. Go to Waste -> Manifest -> Manifest from the main menu on the left side of the screen. 10. 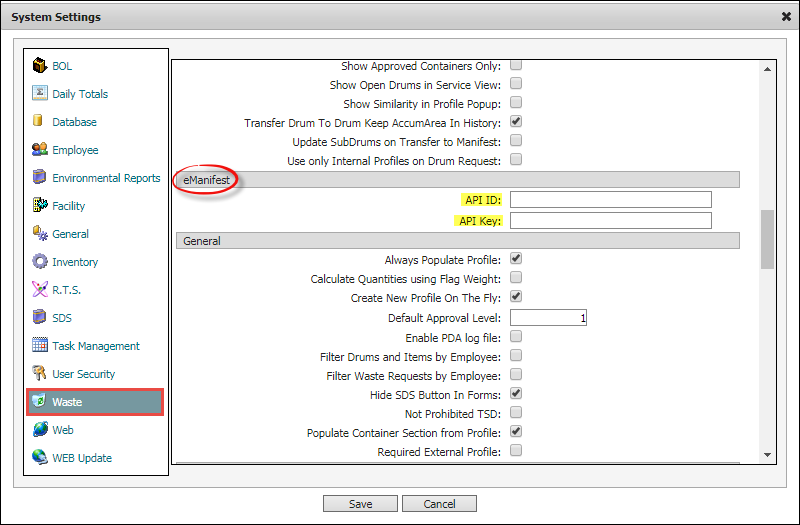 Select Actions -> Upload Manifest to CDX in order to submit the manifest. If the upload is successful, the system will display possible warnings (but no errors) on the Manifest Upload Results window. 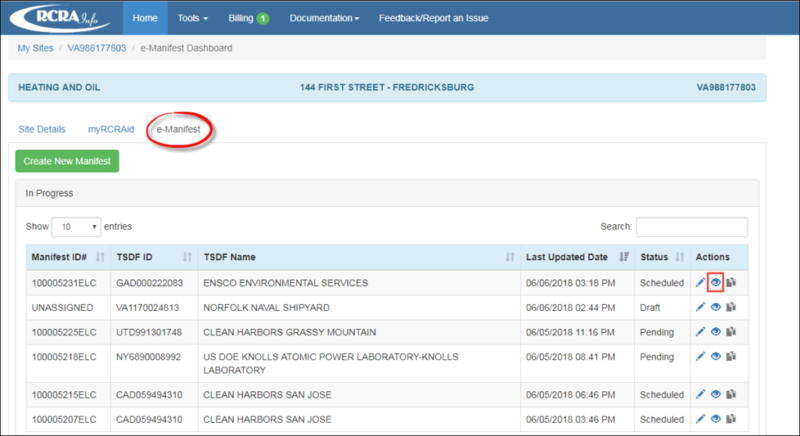 Result: A Manifest ID number will be automatically assigned (generated from EPA site) to the manifest record. Refresh the page to view the assigned Manifest ID number. Go to “Uniform Manifest #” field located on top of the active page. The manifest was successfully submitted and now is available on the EPA site. Users can view the uploaded manifest on the EPA site (https://rcrainfopreprod.epa.gov/rcrainfo/action/secured/login#/). TSDF and Transporters are able to sign the manifest through the EPA site.